Providing you the best range of digital portable receiver, digital portable transmitter, 28-slot storage and charger carry case, 12-slot storage and charger carry case, 4 slot charger and supercardioid dynamic microphone with effective & timely delivery. MTG-100 is an innovative digital wireless tour guide & language interpretation systems. 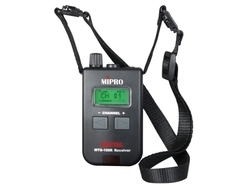 It is ultra-compact, lightweight and Digital Portable Receiver easy to use. Digital design provides crystal-clear audio quality, secured and reliable transmission, and insensitive to interference attributes that are unmatched by the deficiency of simple analogue design systems. ISM band requires no user licensing; thus, no worries about changing groups and channels when operating in multiple countries. Each band is preset with switchable frequencies and ensures several different tours or groups can be operated at the same venue without interfering with each other. Lithium rechargeable battery system comprises MTG-100R receiver, MTG-100T transmitter and MTG-100C-4, MTG-100C-12 or MTG-100C-28 storage and charger carry case. Built-in lithium polymer rechargeable battery is used to resolve the troubles of changing the battery and save you a significant amount of money years to come. This system is ideal for small to large, indoor or outdoor applications for guides, interpreters or presenters to communicate effectively to a group of people, rejecting irritating surrounding noise. Guided Tours Factories, Museums, Tourist Attractions, Zoos & Theme Parks, Cruise Ships & Buses, Schools, Meetings & Lectures, Employee & Dealers Training, Hotels and Resorts, Special Events. Assistive ListeningEducational Institutions, Corporate Meetings, Training and Seminars, Theaters, Governmental Agencies, Houses of Worship, Conventions and Auditoriums. Language Interpretation Courtrooms, Educational Institutions, Conferences or Conventions, Houses of Worship, Medical Facilities, Employee & Dealers Training, Hotels & Resorts. 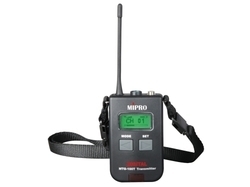 MTG-100 is an innovative Digital Portable Transmitter digital wireless tour guide & language interpretation systems. It is ultra-compact, lightweight and easy to use. Digital design provides crystal-clear audio quality, secured and reliable transmission, and insensitive to interference attributes that are unmatched by the deficiency of simple analogue design systems. ISM band requires no user licensing; thus, no worries about changing groups and channels when operating in multiple countries. Each band is preset with 16 switchable frequencies and ensures several different tours or groups can be operated at the same venue without interfering with each other. Lithium rechargeable battery system comprises MTG-100R receiver, MTG-100T transmitter and MTG-100C-12 or MTG-100C-28 storage and charger carry case. Built-in lithium polymer rechargeable battery is used to resolve the troubles of changing the battery and save you a significant amount of money years to come. This system is ideal for small to large, indoor or outdoor applications for guides, interpreters or presenters to communicate effectively to a group of people, rejecting irritating surrounding noise. 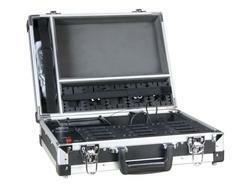 Our firm is involved in manufacturing and supplying a huge range of 28-Slot Storage and Charger Carry Case. 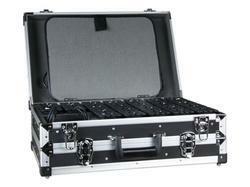 Our firm offers a high-quality range of 12-Slot Storage and Charger Carry Case. Our firm is involved in manufacturing and supplying a huge range of 4 Slot Charger. We design the given product following industrial standards by making use of best quality material and modern technology. Each charging slot has separate "red" charging and "green" ready indicator. 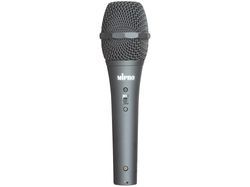 We hold expertise in offering the wide gamut of Supercardioid Dynamic Microphone. Fitted with MU-29 super cardioid capsule module. We hold expertise in offering the wide gamut of Stereo Headphones. Install to MTG-100R or MTG-100Ra portable digital receiver. 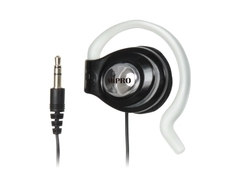 We hold expertise in offering the wide gamut of Single-Sided Earphone. Install to MTG-100R or MTG-100Ra portable digital receiver.